This week’s image is of one of the most popular characters on television. It is the Madagascar Day Gecko, alias the walking, talking, Geico representative. 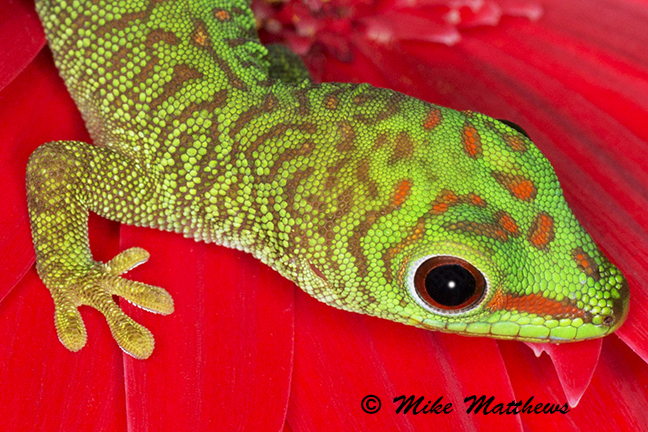 This day gecko, native to Madagascar, is now also thriving in south Florida particularly in the Florida Keys. The females typically lay two eggs at a time, and when they hatch out they look like this little guy. I recently added him to my collection for my upcoming macro workshops, and he made a fun subject to photograph this weekend sitting on a gerber daisy. The adults grow to a maximum of 7-8 inches, but some may grow to be a little larger. So the next time you are in the Florida Keys, take a look around and see if you can spot one of these little green gems. Hope you enjoy this week’s photos.